Does the government really understand e-bikes? Does the British government understand e-bikes? They're increasingly popular in certain other parts of Europe, with about 600,000 expected to be sold this year in just Germany and the Netherlands. By contrast, British sales are optimistically esimated at about 20,000. By far the biggest global market is China, where electric bikes sell in the tens of millions each year. However, while the sort of machine you can ride without a helmet or insurance in the EU is limited to 25kph and has to have pedals, those in China are generally more like electric mopeds, so it's hard to make a direct comparison. They also tend to be powered by lead-acid batteries rather than litium ion, so are arguably somewhat less green. Some cyclists have a mixed attitude to e-bikes, also known as pedelecs. Why not just get a bike, they ask, rather than spend considerably more money on something significantly heavier and limited by range? My own view is that e-bikes make sense for those, say, nervous about a longer or hilly commute, or perhaps taking to two wheels for the first time. There's also an argument that for slower riders they can be safer in heavy traffic – the battery swiftly whisks you away from standstill at traffic lights, and can help you keep up with the traffic. Either way, someone on an e-bike is, for me, eminently preferable to someone in a car, and there is anecdotal evidence in Germany and elsewhere that many e-bike purchasers are making that choice, rather than simply replacing a pedal bike with a battery-assisted one. Now, no one could accuse ministers of not being ambitious when it comes to electric cars. There is a £300m pot to provide subsidy grants of up to £5,000 for electric car purchases. Last month, Norman Baker, then a transport minister before his appointment as a Home Office minister in this week's reshuffle, announced a national, long-term strategic plan to promote the use of so-called ultra low emission vehicles (ULEV), with a budget of £500m, administered by the Department for Transport's Office for Low-Emission Vehicles. It goes without saying that there's no parallel office for cycling, let alone a long-term strategic plan for cycling, but that's an argument for another day. But despite all this money, and all the promotion and free charging points, electric cars (which, remember, don't actually reduce congestion in clogged inner cities and, some critics argue, are not that much greener than conventional vehicles) are hardly taking off. A mere 2,198 fully electric cars and 264 vans were sold in Britain last year, according to DfT statistics. The cycle blogger Mark Treasure was tweeting from a "sustainable transport" conference in London last week and heard this illuminating figure: there are, on average, just 12 public charges of electric vehicles per day, in the entire east of England. So, all the more reason to push e-bikes as a cheaper, more accessible alternative to petrol cars in urban and suburban areas? The DfT claims so, saying it had talked to the British Electric Bicycle Association and e-bike retailers before producing its ULEV plan. The strategy clearly recognises the health and congestion benefits of e-bikes and highlights that, unlike registered vehicles, they pay no tax or insurance and are very inexpensive to run. We will shortly be calling on the industry to give us their thoughts on how we can best spend the £500m investment we have committed to ultra low emission vehicles. We expect to receive some innovative and exciting submissions from the powered two wheeler sector. But will e-bikes really benefit? James Fitzgerald, who runs the Justebikes retailer, thinks not. He wrote to Baker, whose remit took in walking and cycling, to ask whether the DfT would do more to promote e-bike use. Baker's reply to Fitzgerald was interesting, if at times a little hard to understand. Any spending, he said, "must be targeted where it will be most effective". He then points out that motorbikes only account for 0.5% of domestic greenhouse gas emissions, presumably assuming motorbike riders are the only people potentially interested in e-bikes. I would need to see some evidence that e-bikes were capable of generating modal shift from cars in a way that transcends modal shift to either motorcycles or pedal cycles. Would also need to be convinced that any support would not cause unwelcome modal shift from pedal cycle to e-bikes. Now, it's probably fair to say that some people opt to buy an e-bike when they might otherwise have bought a pedal bike. In Germany, for example, 50,000 more e-bikes were sold in 2012 than 2011, which could partly account for a sales drop of 150,000 for conventional bikes, although retailers mainly blamed bad weather that year between Easter and July. But is it still not worth a punt? Even if, say, 50% of e-bike owners moved from car use and 50% from standard bicycles, the environmental payoff is still significant. Either way, Baker's answer does, to me, show a lack of vision and opportunity. About two-thirds of all journeys in this country are less than five miles, while a similar proportion of commutes are about six miles or less. 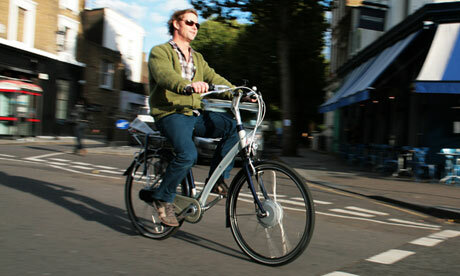 Surely at least a proportion of those who currently drive and don't fancy cycling could be persuaded on to an e-bike? Even a 12-mile return commute is fairly easy with some battery help. I'm not suggesting the government chucks a few hundred pounds of subsidy towards every e-bike (thought that does, to me, make more sense than the £5,000 electric car bung) but it would be nice to think ministers are at least treating the sector seriously, and not dismissing it out of hand. I will speculate two reasons for this state of affairs. Firstly, as Crossrail and HS2 show, governments love huge infrastructure projects. It makes ministers feel as if they're doing something tangible. Scrapping either in place of a 20-year strategy to boost cycling would, in my view, make a significantly greater impact on the nation. But it doesn't involve the grandeur of scale models, ribbon-cutting ceremonies and shiny new kit. To boost cycling is incremental, not monumental. Secondly, just look at the sponsors of these "sustainable transport" conferences. The one attended by Treasure last week was bankrolled by, among others, the British Parking Association and a company that installs electric vehicle charging points. Neither of these has much of a vested interest in seeing e-bikes sell well.